Declan Mayton, from left, Carmela Lilly and Oscar Hokom put pen to paper working on a writing warm up exercise at Tuesday’s NaNoWriMo course at the Marian County Public Library. 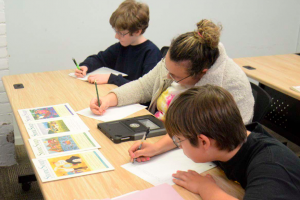 FAIRMONT, W.Va. – Despite being surrounded by books, kids in the Marion County Public Library Tuesday weren’t there to read, but to create their own reading material. November is National Novel Writing Month (NaNoWriMo) and the library is hosting an educational program to introduce children and young adults to the art, allowing them to take the role of authors for the first time.